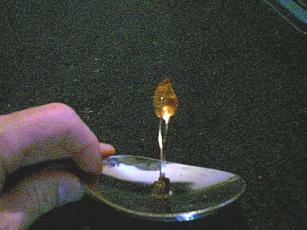 Small pocket sized reflectors have been around for many years, such as a solar cigarette lighter. These as well as other dished reflectors gather the suns rays and focus them to a central point in front of the dish when it is pointed towards the sun. The heat can be even hotter than that with a burning (magnifying) glass, and some folks use this type of a reflector as a solar stove with a pot hanging at the focal point. You may even have a makeup mirror at home that could be used. these are usually the magnifying types. To improvise a reflector you could take a shallow bowl and cover it with aluminum foil, shiny side up and by holding this to the sun find the hot focal point. You may have to try a few different bowls to find one whose focus is neither too close or too far away. Of course improvised reflectors are not as good as pre-made ones. Examples of where to find pre-made dishes that could work are those small dish network antennas on many a roof, or the stainless steel mixing bowls that are sold everywhere. Just remember: dish shaped and shiny. 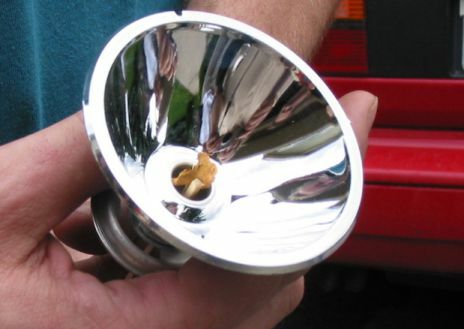 A reflector removed from a flashlight can in some cases ignite a piece of very flammable tinder that is placed where the bulb is usually located. This photo shows a piece of tinder sticking out where the bulb would usually be located. Shine this into the sun and enough heat might be focused to heat up and ignite the tinder. Photo by Allan "Bow" Beauchamp This is a solar cigarette lighter that was featured in the Radio Shack catalog at one time. The center piece that holds the cigarette folds down for storage. It was originally intended for lighting cigarettes.